Revelation 20:1-3 (KJV) And I saw an angel come down from heaven, having the key of the bottomless pit and a great chain in his hand. And he laid hold on the dragon, that old serpent, which is the Devil, and Satan, and bound him a thousand years, And cast him into the bottomless pit, and shut him up, and set a seal upon him, that he should deceive the nations no more, till the thousand years should be fulfilled: and after that he must be loosed a little season. Many Christians assume that neither the Kingdom of God in which Christ is king or “the binding of Satan” has taken place. But is this the testimony of scripture. Is this what the scriptures teach? Let’s explore this subject together to learn what the scriptures reveal! Matthew 16:18-19 (KJV) And I say also unto thee, That thou art Peter, and upon this rock I will build my church; and the gates of hell shall not prevail against it. And I will give unto thee the keys of the kingdom of heaven: and whatsoever thou shalt bind on earth shall be bound in heaven: and whatsoever thou shalt loose on earth shall be loosed in heaven. Luke 10:17-19 (KJV) And the seventy returned again with joy, saying, Lord, even the devils are subject unto us through thy name. And he said unto them, I beheld Satan as lightning fall from heaven. Behold, I give unto you power to tread on serpents and scorpions, and over all the power of the enemy: and nothing shall by any means hurt you. Satan is “bound” when the saints submit themselves to the Lord. Resisting Satan will cause him to flee! James 4:7-8 (KJV) Submit yourselves therefore to God. Resist the devil, and he will flee from you. Draw nigh to God, and he will draw nigh to you. Cleanse your hands, ye sinners; and purify your hearts, ye double minded. 1 John 4:4 (KJV) Ye are of God, little children, and have overcome them: because greater is he that is in you, than he that is in the world. When the saints are dead in their sin, the Lord forgives us of our trespasses. The long list of charges that Satan has bound us with are blotted out and nailed to the cross. It was Jesus Christ who “spoiled principalities and powers.” Christ made an open show of these defeated principalities and powers when He triumphed over them. Jesus Christ destroyed the devil who had the power of death. The scriptures below clearly illustrate how devils’ power is reduced or bound. Colossians 2:13-15 (KJV) And you, being dead in your sins and the uncircumcision of your flesh, hath he quickened together with him, having forgiven you all trespasses; Blotting out the handwriting of ordinances that was against us, which was contrary to us, and took it out of the way, nailing it to his cross; And having spoiled principalities and powers, he made a shew of them openly, triumphing over them in it. Satan Bound for (only) a Thousand Years? Revelation chapter 20 verses one thru three are the go-to scriptures when discussing the binding of Satan for a thousand years. First, should we take the thousand years as a literal one thousand years? What does the word a thousand mean? Will Satan only be bound for a thousand years? Well, it’s been almost two thousand years since the resurrection of Christ! To understand how we should interpret a thousand years let’s see how the word was used in other scriptures. Job 9:1-3 (KJV) Then Job answered and said, I know it is so of a truth: but how should man be just with God? If he will contend with him, he cannot answer him one of a thousand. Psalm 50:10 (KJV) For every beast of the forest is mine, and the cattle upon a thousand hills. “As seven mystically implies universality, so a thousand implies perfection, whether in good or evil” – Jamieson, Faust & Brown Bible Commentary. “But it is not likely that the number, a thousand years, is to be taken literally here, and year symbolically and figuratively in all the book beside” – Adam Clarke’s Commentary. “A thousand years. I am not prepared to say that this blessed period shall be limited to a thousand years…” – Johnson’s Notes on the New Testament. 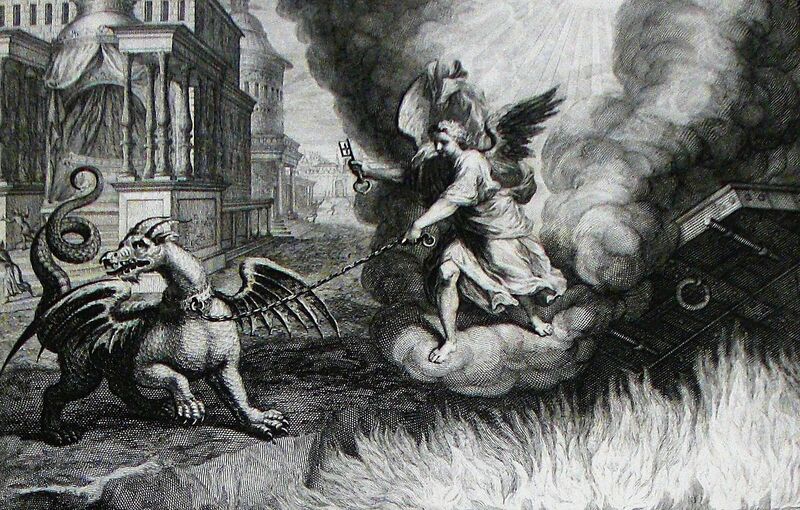 Jesus came to destroy the works of the devil. Jesus demonstrated His power by castings out devils by the “Spirit of God.” The casting out of devils was a sign that the kingdom of God had arrived, in the days of the first century Church. Jesus entered the house of Satan by first binding him. The scriptures reveal that Satan is a bound foe. 1 John 3:7-9 (KJV) – Little children, let no man deceive you: he that doeth righteousness is righteous, even as he is righteous. He that committeth sin is of the devil; for the devil sinneth from the beginning. For this purpose, the Son of God was manifested, that he might destroy the works of the devil. Whosoever is born of God doth not commit sin; for his seed remaineth in him: and he cannot sin, because he is born of God. Matthew 12:25-29 (KJV) And Jesus knew their thoughts, and said unto them, Every kingdom divided against itself is brought to desolation; and every city or house divided against itself shall not stand: And if Satan cast out Satan, he is divided against himself; how shall then his kingdom stand? And if I by Beelzebub cast out devils, by whom do your children cast them out? therefore they shall be your judges. But if I cast out devils by the Spirit of God, then the kingdom of God is come unto you. Or else how can one enter into a strong man’s house, and spoil his goods, except he first bind the strong man? and then he will spoil his house. James 1:13-17 (KJV) Let no man say when he is tempted, I am tempted of God: for God cannot be tempted with evil, neither tempteth he any man: But every man is tempted, when he is drawn away of his own lust, and enticed. Then when lust hath conceived, it bringeth forth sin: and sin, when it is finished, bringeth forth death. Do not err, my beloved brethren. Every good gift and every perfect gift is from above, and cometh down from the Father of lights, with whom is no variableness, neither shadow of turning. In my view, the binding of Satan for a thousand years should not be taken literally. A better interpretation is to view the term “a thousand” symbolically and figuratively. Satan has been “bound” ever since Jesus gave us the victory over death, hell and the grave. Our spiritual chains are loosed when we are baptized by God’s Holy Spirit. We become part of the Kingdom of God which is “righteousness, and peace, and joy in the Holy Ghost (Romans 14:17 KJV)”. We are no longer under the authority of Satan. He is forever defeated and bound!